Arinsal, Andorra, is part of the Vallnord ski area, meaning you also have the option of exploring neighbouring Pal and Arcalis during your ski holiday. 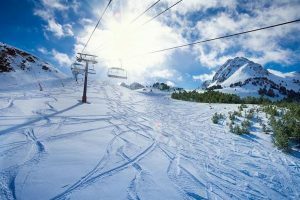 Beginners will feel right at home as they spend their first couple of days on the lower parts of the Arinsal sector, while intermediates can jump aboard on the cable car to the wide, tree-lined runs of Pal, the next valley over. When your legs have had enough of the slopes, you can head for the bottom where the decent après ski scene starts. Situated a short walk from the village centre and with the convenience of a ski bus stop right on the door step, the well-equipped Sant Roma Apartments offer a good standard of accommodation and fantastic value for money. Normal Crystal Ski terms and conditions apply. Prices do not include optional extras such as insurance, in-flight meals or group seating.